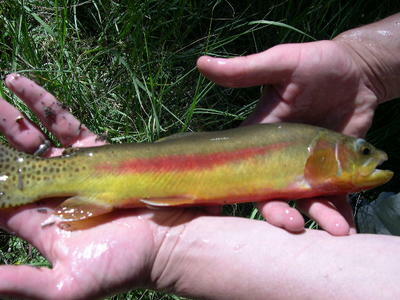 Golden Trout, and to locate transplanted populations that may exist outside their native range, CDFG is conducting a systematic collection of tissue samples from trout throughout the southern Sierra in various waters. Tissue samples collected in 2004 will later be used for DNA analysis which will help toward a better understanding of the genetic composition and geographic distribution of remaining populations of California golden trout." The way that the DFG Biologists chose the sampling sites was to examin old planting records, interview old-timers etc. to gather any information about potential locations goldens may have been transplanted that are both above a barrier to prevent interbreeding with non-goldens and also had not subsequently been planted with rainbows. 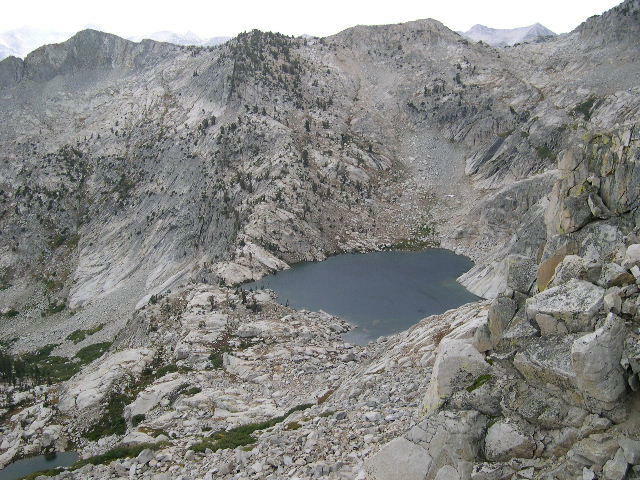 The hike in to our designated sample waters was a grueling two day march of ~15 miles and 7000 vertical feet--from a trail head of 4000 feet over an 11,000 foot pass and back down 2000 feet or so. 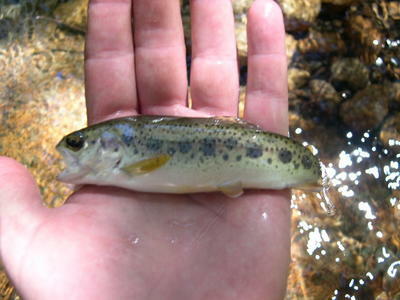 We were to sample one small creek before going over the pass, but when the first fish came out it was a rainbow. No pure goldens to be found. Here is one of the rainbows, unfortunately his colors have faded a bit by the time the photo was taken. When he was first removed from the water his par marks were a deep purple. 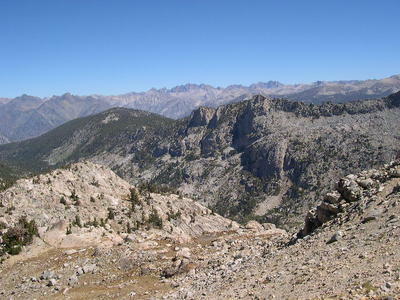 After an overnight at the first creek and a long second day of hiking we summited the pass. 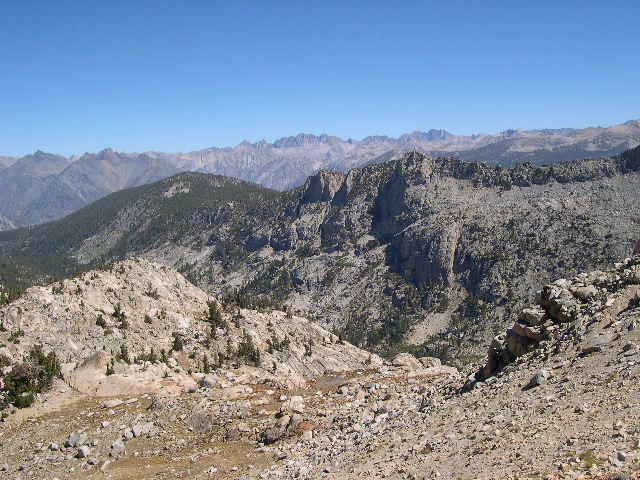 Here is the view from the pass on the way down to the main sample area. 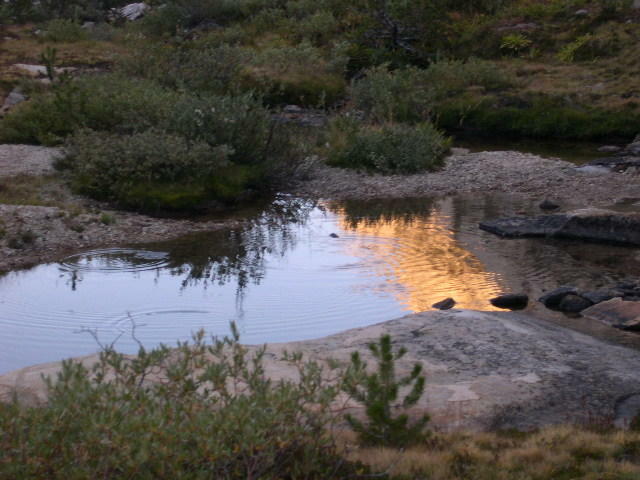 The main creek for sampling is behind the small hill in the foreground running to the left down the valley. Looking more right you could see one of the lakes we were to sample. Unfortunately, as far as we could tell, this lake was sterile. Eventually though we did find the good stuff. 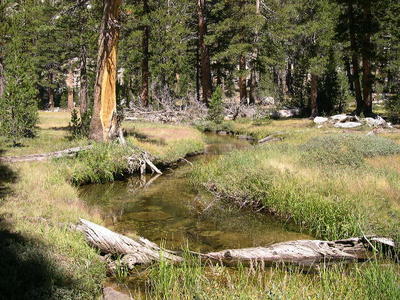 We hiked down into the main valley through which this great little creek ran. The creek was absolutely loaded with beautiful goldens! We covered 2.5 miles of creek, taking 40 fin samples, each from a different pool. Most of the fish were in the 5-9 inch range, although I managed this monster of 13 inches from a deep shady pool (note the lack of spots below the lateral line and the white of the fin tips). One last shot to give you an idea of just how many fish were in this creek--look at the three rings from rising fish in this picture. Hopefully the fish we found will be "genetically pure". Nice work on the Goldens and the fins samples. I wish more people like yourself would volunteer thier time with sampling studies. Keep up the good work and mumms on the locations of the sensitive species.